Despite all being social savvy tech-lovers, the HootSuite family also shares a few other passions, like cycling, yoga, and homegrown art. HootSuite’s affinity for local art was something on everyone’s mind while making the move to our new office space in January, and has translated into a series of incredible murals. 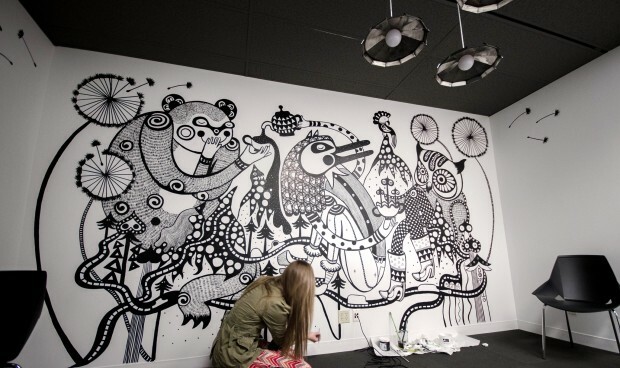 While we’ve already taken a look at the intricate owl mural by HootSuite employees Sandy and Steve Pell, there are other breathtaking pieces of art that we thought our users would enjoy. Ola Volo’s mural is of animals having a tea party, though it’s filled with other little surprises. Photo courtesy Ola Volo. 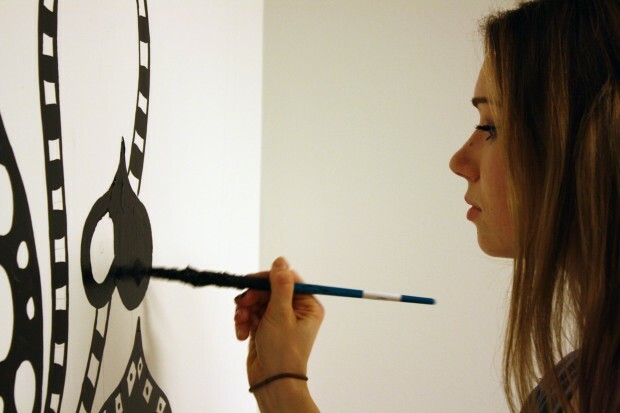 Ola Volo says she drew inspiration from the “social” aspect of social media while creating her mural. Photo courtesy Ola Volo. Imagine our surprise when we walked in to work after a long weekend and saw this amazingly intricate black and white scene. The mural features bears, birds, mountains and more, with enough detail that every time you see it you notice something new. While that boardroom is now booked for meetings all day every day (who wouldn’t want to stare at that while they work? ), we have still come up with a way to make Volo’s mural accessible to anyone who wants to enjoy it. HootSuite is offering new desktop, iPad and smartphone wallpapers of the mural, all of which are now available on our media page. The backgrounds have been optimized to perfectly fit a number of devices and screens. all of which you can find below. We’d like to thank Volo for accepting our invitation and creating a piece of art that will be adored and cherished by our owls for many years to come. To see more of her fantastic art, you can visit Volo’s Facebook page, Twitter page and website.